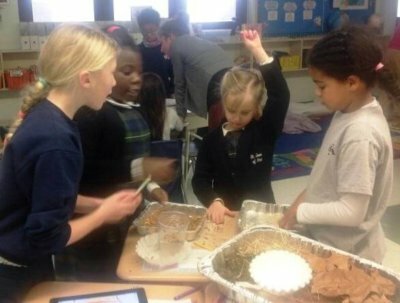 Mrs. Kathleen Smith, who currently teaches 3rd grad at St. Joan of Arc School in Aberdeen, encourages critical thinking from her students by incorporating STEM activities and collaborative groups into her classroom. In the picture above, Mrs. Smith is working with a group of students to complete a STEM project on water filtration. Students in 1st and 3rd grades worked together to create the best filter for water. They used the Engineering Design Process to create and improve upon their designs. Mrs. Smith often uses collaborative groups to complete projects and classwork, encouraging critical thinking and independence in her students. Mrs. Smith has been instrumental in St. Joan of Arc applying for and receiving its Green School Certification and the Harford County Recycling Award. She serves on the STEM Committee and compiled evidence for STEM recognition from Notre Dame University of Maryland . This committee is actively involved in the process of seeking STEM certification from AdvancEd.